"Want To Bring Your Houses Windows To Life? Looking For A Birdfeeder That's 100% Clear, Quality Built, And Effortless To Use? Get The Real Thing Here For Less Than the Price of Dinner Out!" Looking for a quality and modern see-through window bird feeder? Done with cheap birdfeeders that feed more squirrels than birds? You'll turn any outdoor window into a spectacle with this sensible solution. Enjoy your neighborhood wildlife, at a price that makes sense. Nothing else (online or in a store) compares! You deserve to be closer to nature; that's why we made this. The feeling when your first visitor arrives to say thank you will be worth far more than the price you're paying. Even if you've tried other products or solutions, you NEED to try this! [FAST & EASY INSTALL] EFFORTLESS FILLING! LARGE 2 CUP CAPACITY FEEDER (11.8x5x4"), Drain holes in the platform tray prevents seed from staying wet. NOTHING COMPARES -Don't price shop. Unlike other clear window bird feeders, ours is built to last & stays on strong & tight (even in harsh weather)! Our Feeders Make Great Gifts for Teachers, Birdwatchers, & the Bird Lovers in your life, and can keep an Inside Cat happy for hours! Click [Add to Cart] to turn your ordinary window into an amazing wildlife show, impress your family and friends, AND keep more money in your pocket by avoiding cheap feeders that don't work or expensive battles with squirrels...a real win-win! Note from the manufacturer: Unfortunately, demand has spiked as word has spread about the quality and value of this feeder...this month, especially. If you see the green "In Stock" above, place your order before the sale ends. BIRD WATCHING THE EASY WAY - No need for expensive kits, poles, binoculars, and accessories. Simply attach the all weather suction cups with hangers to your outside window. Included hooks make the feeder station removable for no mess filling and makes cleaning a snap. Stand back, admire your work, and make plans to celebrate the arrival of your wild birds. PROVIDES HOURS OF ENTERTAINMENT - Share your morning coffee, pass the time while doing kitchen chores, or simply relax with after a long day and hangout in your favorite chair while enjoying a prime view of your songbird friends. Get unlimited close up views of your beautiful birds just inches from you. Perfect addition to any house, apartment, office, nursing home, school & more. You'll wish you had it years ago. CREATE MEMORIES THEY'LL CHERISH FOREVER - Teaching younger generations to nurture nature is a lesson they will remember forever. Seeing the look on a child's face when your majestic visitors arrive will make you grin. Be the cool one that all the kids want to come visit anywhere! FOR BIRDS BIG AND SMALL - Whether you want to attract Cardinal, Finch, Goldfinch, Dove, or Chickadee, we've got you covered. Our transparent feeders unusual design allows multiple birds feeding at once, yet the rain & snow resistant cover acts as a deterrent for nuisance birds such as Grackles and Starlings and prevent them from gobbling all of your seed. 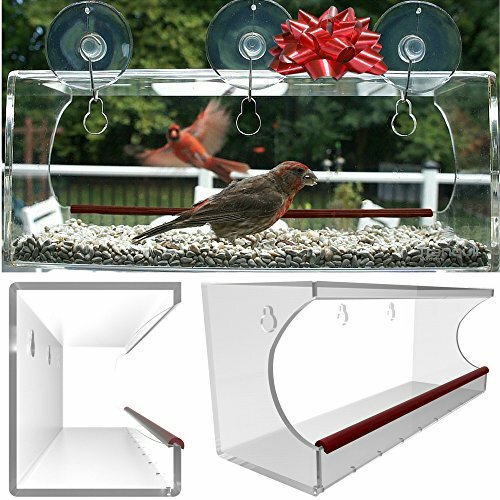 YOUR BIRDS WILL THANK YOU - Included rubber tray perch provides comfort for your birds making them stick around longer so you and your pet can admire them more. Pro Tip: When mounted on a high window and away from tree branches & jump-off points makes this a virtually squirrel proof bird feeder. Squirrels and other pests are unable to climb glass windows. If you have any questions about this product by Tranquil Outdoors, contact us by completing and submitting the form below. If you are looking for a specif part number, please include it with your message.